What can I say? My desire to try new raw ingredients has led me yet again to a new vegetable I've never tried before: Opo Squash. I picked it up on a run to the Ranch 99 store, which carries foods used in a variety of Asian cuisines. As you can see, this is no small squash to mess with -- it's about a foot long and at least a good 4 or 5 pounds. Gigantic in terms of the closest common vegetable that comes to mind - a zucchini - but relatively underweight compared to, say, a newborn. 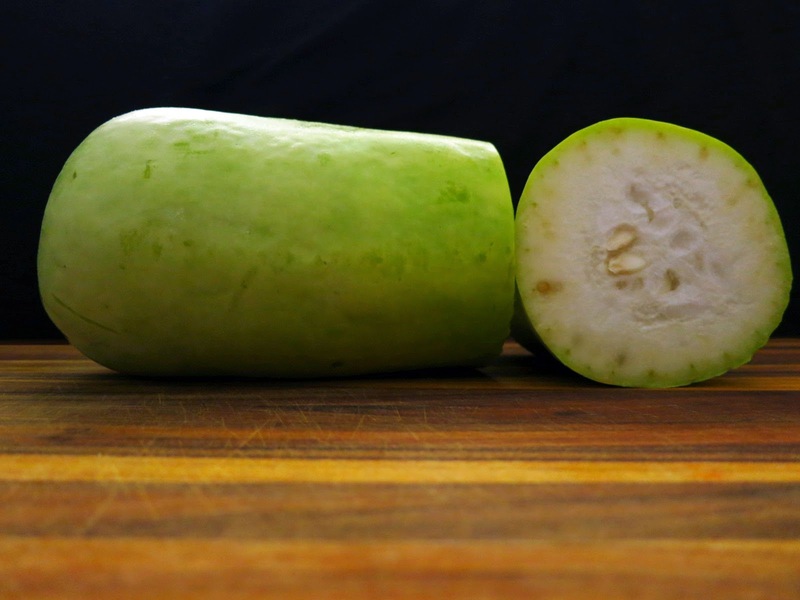 Upon bringing the opo squash (aka bottle gourd) home with my other haul of obscure (to me, at least) ingredients, I quickly got to work learning about it. Read on for notes on selection, storage, uses, recipes, and one recipe I decided to try! 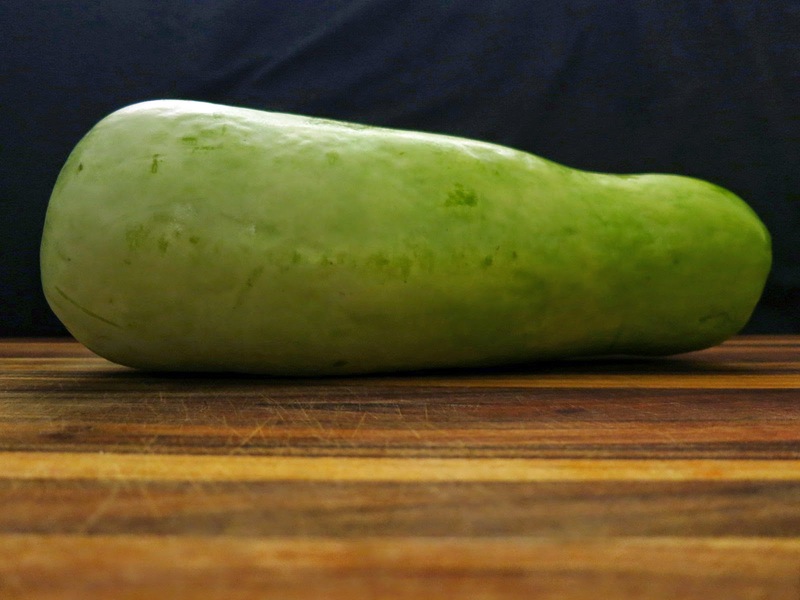 If you're looking to buy a bottle gourd, be aware that it goes by many names, including "calabash" and "long melon." The varieties sold in Chinese groceries are often labeled "opo squash," and sometimes "opu" and "upo". Chinese groceries also sell a variety called "Moa Gua" or "hairy squash," which is darker mottled green and covered in small hairs. 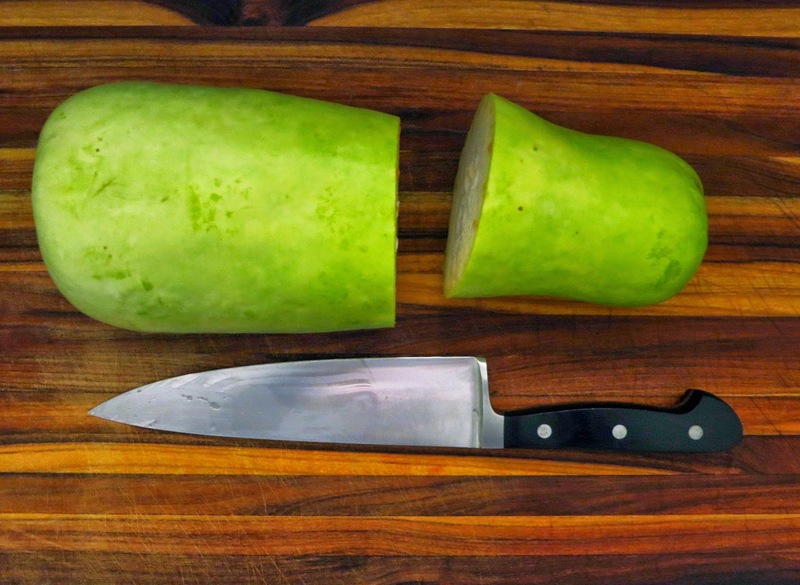 In Indian groceries, bottle gourd may sell under the names "lauki" and "sorakaaya." Italian markets may sell the squash under the name "cucuzza." The fruits come in a variety of shapes and sizes -- The type pictured in this post is an opo squash from a Chinese market. Each variety has unique qualities -- I've only tried the squash pictured above, sold as an "opo squash" at a Chinese market, so I can only speak to the qualities of this variety. The opo squash I tried was light green, heavy, shaped like a large zucchini, and smooth. The skin was thin, akin to a zucchini. The flesh was like a zucchini, too, but chewier and more dense, with a flavor akin to a cross between a cucumber and zucchini. The center flesh, where the seeds were, is spongier and the young seeds are crisp and slightly sweet. Choose a firm, heavy, smooth, unblemished squash with no cuts, bruises, or diseased areas. Store it in the refrigerator for a longer shelf life. Calabash can be eaten as a vegetable, similar to summer squash, when young. 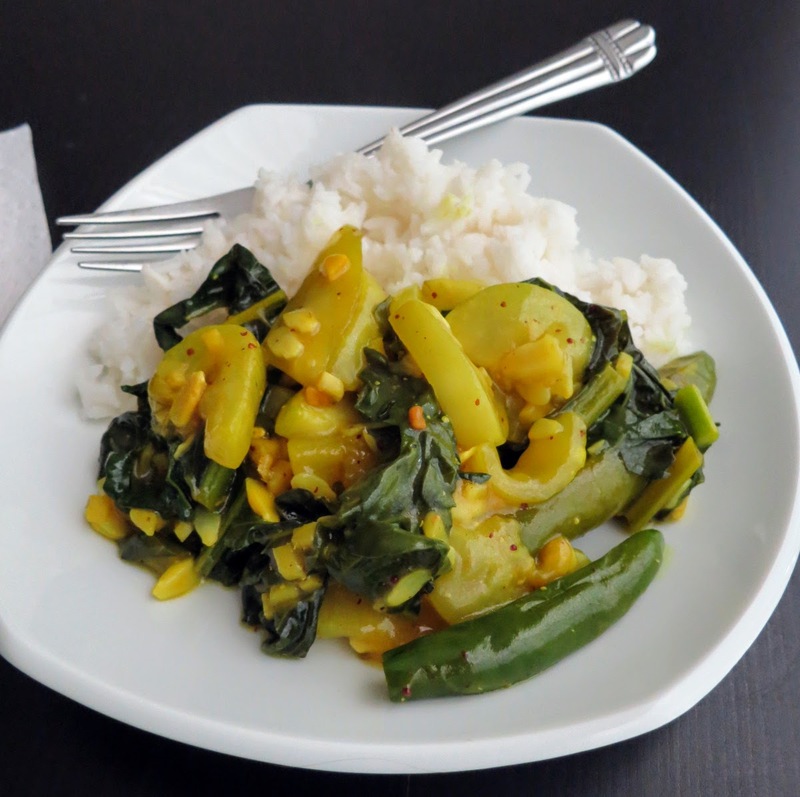 The leaves, shoots, and tendrils of the plant can also be eaten. A typical preparation in India is a chickpea and gourd dish called lauki channa. Common dishes in China include stir fries and soups. In Central America, the seeds are sometimes toasted, ground, and used as an ingredient in a sweet drink known as horchata. Calabash, when mature, are dried and used for their tough outer shell, which can be made into storage containers (including liquid storage), utensils, instruments, and many other items. Hopefully some of you are feeling inspired to try something new in the vegetable department! Here's to variety! I just bought this squash out of curiosity last night. Your blog results came up first when I search for "opo squash recipes". Very cool. Im off to cook it tonight! My neighbors were growing these and they grew over a wall and into our yard. I was wondering what was hanging from our tree. When they came to collect their "melons" they offered us one since we let it stay there. I had no idea what to do with it....now I know ...thank you. My neighbors don't speak much English and I speak no Chinese but from what I gathered, we need to peel and seed them first.